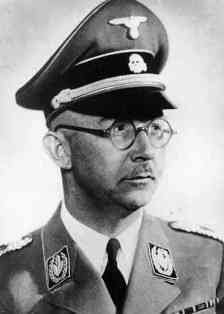 Heinrich Himmler was born 7 October 1900 in Munich to a middle-class Bavarian family. His father was Joseph Gebhard Himmler, a secondary-school teacher and principal. His mother was Anna Maria Himmler (maiden name Heyder), a devout Catholic and attentive mother. 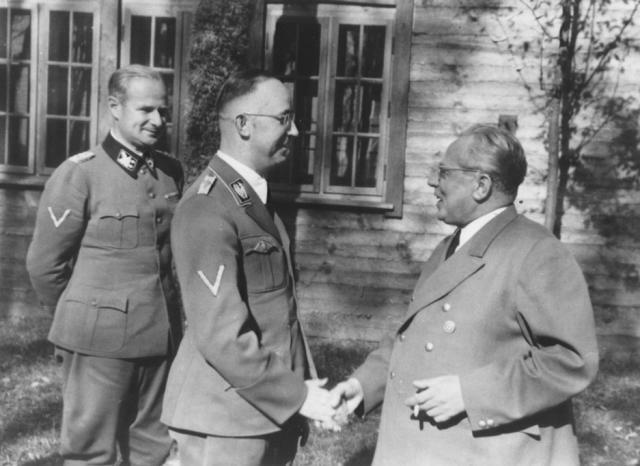 Heinrich had an older brother, Gebhard Ludwig Himmler, and a younger brother, Ernst Hermann Himmler. Heinrich was named after his godparent, Prince Heinrich of Wittelsbach of the royal family of Bavaria, who was tutored by Gebhard Himmler. Educated at secondary school in Landshut, Himmler served as an officer cadet in the 11th Bavarian Regiment at the end of WW1, although he saw no active service. After working briefly as a salesman for a fertilizer manufacturing firm, Himmler joined the Nazi party and in November 1923 participated in the Beer-Hall Putsch as a standard bearer at the side of Ernst Röhm. Influenced by Nazism and by the Artamans, an obscure sect advocating a Teutonic rural life, he turned to racism and romantic Teutonism. He later joined the SS in 1925, and by 1927 had been appointed deputy Reichsführer-SS, a role he began to take very seriously. Upon the resignation of SS Commander Erhard Heiden, Himmler was appointed as the new Reichsführer-SS in January 1929. At the time Himmler was appointed to lead the SS, it numbered only 280 members and was considered a mere battalion of the much larger SA. Himmler himself was considered only an SA-Oberführer, but after 1929 he referred to himself as the "Reichsführer-SS". In 1936 Himmler gained further authority as all of Germany's uniformed law enforcement agencies were amalgamated into the new Ordnungspolizei, whose main office became a headquarters branch of the SS as Himmler was accorded the title Chief of the German Police. Himmler however was never able to gain operational control over the uniformed police. The actual powers granted him with the appointment were those previously exercised in police matters by the Ministry of the Interior, and not even all of these. It was only in 1943 when Himmler was appointed Minister of the Interior, that the transfer of ministerial power was complete. Indeed his full title was Reichsfuhrer-SS and Chief of the German Police in the Ministry of the Interior (abbreviated as RFSSuCdDPidMI) which clearly indicates the limits of his brief, and though Himmler tended to omit the idMI in correspondence, his powers remained as they were. Germany's political police forces came under Himmler's authority in 1934, which he organised into the Gestapo as well as Germany's entire concentration camps complex. In October 1939 Hitler appointed him Reichskommissar für die Festigung des Deutschen Volkstums and Himmler was given absolute control over the newly annexed Polish territories. 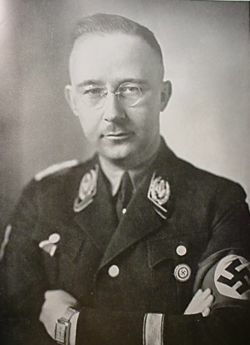 Responsible for bringing people of German descent back from outside the Reich to within its newly expanded borders, Himmler set out to replace Poles and Jews by Volksdeutsche from the Baltic lands, various outlying parts of Poland, and elsewhere. Within a year over a million Poles and 300,000 Jews had been uprooted and driven eastwards. In carrying out his task as supreme overseer of the “Final Solution”, Himmler proved himself a fanatical disciple of Nazi racial theory with an unswerving dedication to its translation into stark reality. So when it came time for Hitler to order the annihilation of the Jews, who better to select to carry it out than the man who was at once his most loyal follower and also in control of the apparatus necessary for its execution? And that is what Hitler did. The precise date is not known, but what is known is that Himmler obeyed the order he received with his customary thoroughness and efficiency. Interestingly enough, for a man who has been demonized as the incarnation of evil, Himmler makes it clear in several speeches that he was not particularly anti-Semitic. He simply blindly obeyed, displaying almost more amorality than immorality. Whatever misgivings Himmler may have had, he carried out his orders with an efficiency and a zeal that at once astonish and repel. The first murders were carried out by Einsatzgruppen by shooting. As deadly as these shootings were, a more "efficient" method had to be found, one that would accelerate the killing and would at the same time spare the SS men the necessity to murder women and children in cold blood. The decision was made to use poison gases (hydrocyanic acid and carbon monoxide) in both stationary and mobile gas chambers in Poland. It is estimated that around 6 million Jews were killed during the Final Solution, along with as many as another 6 million non-Jews. By the time of the invasion of the Soviet Union in June 1941, Himmler’s strangle-hold of the police and security services was evident. He controlled the Reich Main Security Office (RSHA), firstly via Heydrich and then subsequently Kaltenbrunner, the criminal police under Nebe, the Foreign Political Intelligence service under Schellenberg, and the Gestapo under Müller. Through the SS he ruled supreme over the concentration camps and the death camps in Poland, Belzec, Sobibor and Treblinka. Himmler instructed Odilo Globocnik, the SSPF Lublin, to construct these extermination camps in order to effect the destruction of the European Jewry (see the page on his visits to these Aktion Reinhard camps). Himmler also created the Waffen-SS, a powerful private army, whose strength he had expanded from three to thirty five divisions, making it a rival military force to the Wehrmacht. In 1942, Reinhard Heydrich, Himmler's right hand man, was killed in Prague after an attack by Czech special forces. Himmler immediately carried out a reprisal, killing the entire male and many of the female population in the village of Lidice. In 1943, Himmler was appointed German Interior Minister. This was very much a Pyrrhic victory. Himmler sought to use his new office to reverse the party apparatus' annexation of the civil service, and in the process fulfil his long cherished dream of gaining real power over the non-Gestapo police. This hopeless aspiration was easily frustrated by Martin Bormann, Hitler's secretary and party chancellor. It also incurred some displeasure from Hitler himself, whose long-standing disdain for the traditional Civil Service was one of the foundations of Nazi administrative thinking. 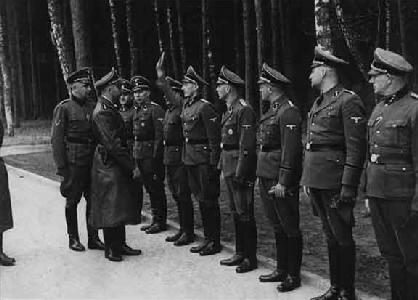 Himmler made things much worse still when following his appointment as head of the Ersatzheer (Replacement Army) (see below) he tried to use his authority in both military and police matters by "bestowing" automatic SS membership on all policemen and then "transferring" them to the Waffen SS. 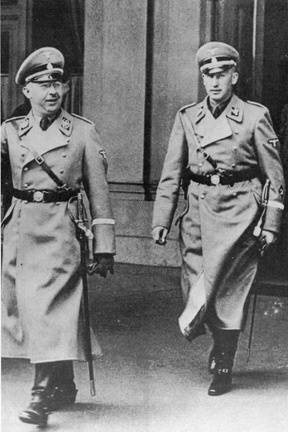 With Himmler about to hang himself Bormann could not give him the rope fast enough, initially acquiescing in the lunacy, until furious protests broke out, then destroying the scheme with a vengeance leaving Himmler much discredited, and his and the SS' relations with the police badly compromised. The involvement in the 20 July 20 1944, plot against Hitler of leaders of the Abwehr (German military intelligence), including its head, Admiral Wilhelm Canaris, prompted Hitler to disband the Abwehr and make the SD the sole intelligence service of the Third Reich. This increased Himmler's already considerable personal power. It also soon emerged that General Friedrich Fromm, Commander-in-Chief of the Replacement Army was implicated in the conspiracy. Fromm's removal, coupled with Hitler's great suspicion of the army led the way to Himmler's appointment as Fromm's successor, a position he predictably abused to enormously expand the Waffen SS even further to the detriment of the rapidly deteriorating Wehrmacht. Unfortunately for Himmler, the investigation soon revealed the involvement of many SS Officers in the conspiracy, including some senior ones, which played into the hands of Bormann's power struggle against the SS, as very few party cadre officers were implicated. In late 1944, Himmler became Commander-in-Chief of army group Upper Rhine, which was fighting the oncoming United States 7th Army and French 1st Army in the Alsace region on the west bank of the Rhine. 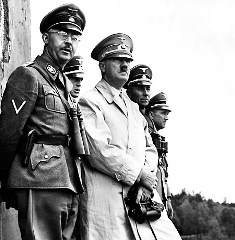 Himmler held this post until early 1945 when, after the Wehrmacht's failure to halt the Red Army's Vistula-Oder offensive, Hitler placed Himmler in command of the newly formed Army Group Vistula. As Himmler had no practical military experience as a field commander, this choice proved catastrophic and he was quickly relieved of his field commands, to be replaced by General Gotthard Heinrici. As the war was drawing to a German defeat, Himmler was considered by many to be a candidate to succeed Hitler as the Führer of Germany. However, realizing the war was lost, Himmler attempted to approach the Allies for peace negotiations through the Head of the Swedish Red Cross, Count Folke Bernadotte. Himmler ordered the cessation of the mass slaughter of the Jews, and proposed the surrender of the German armies in the west, including Denmark and Norway, but the fight against the Russians would continue. Hitler, learning of the betrayal of his most trusted and loyal disciple was enraged, stripping Himmler of all of his offices. Following the German surrender Himmler took on a false identity and tried to escape, but was captured with a number of other SS men in (or near) Bremervörde (Lower Saxony) by British Forces. 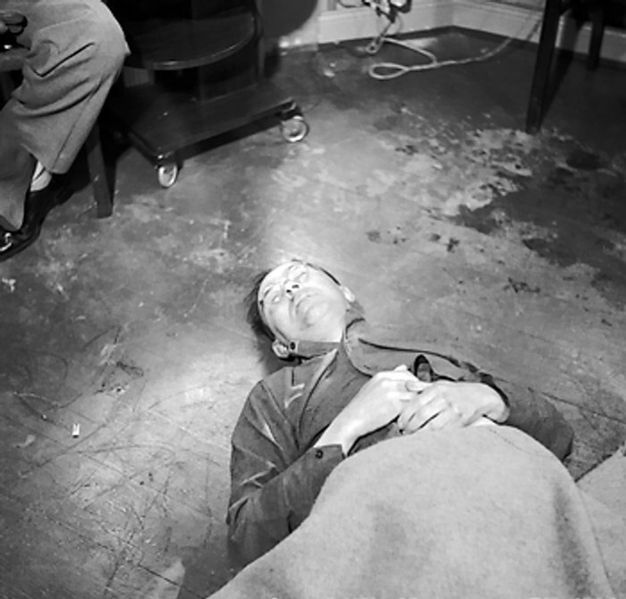 Himmler committed suicide on 23 May 1945.